Raumfahrt+Astronomie-Blog von CENAP - Blog: Astronomie - Ein Forscherteam entdeckt den Standort von massiven Schwarzen Löchern durch das Virtual Observatory. An artist’s illustration of galaxy distribution, a host galaxy of an active galactic nucleus (AGN), and an active galactic nucleus. An AGN is a luminous compact region at the center of the galaxy, powered by the accretion of gas onto the massive black hole. This research reveals that the mass of a massive black hole at the galaxy center is related to the distribution of surrounding galaxies. The research team investigated environment in which a galaxy with a massive black hole at its center exists. The team’s research extended over data for approximately 70 million galaxies, with approximately 10,000 massive black holes researched. This vast amount of data was collected through the Virtual Observatory; it connects a variety of astronomical databases around the world via the Internet, making it possible to comprehensively use the collected data. 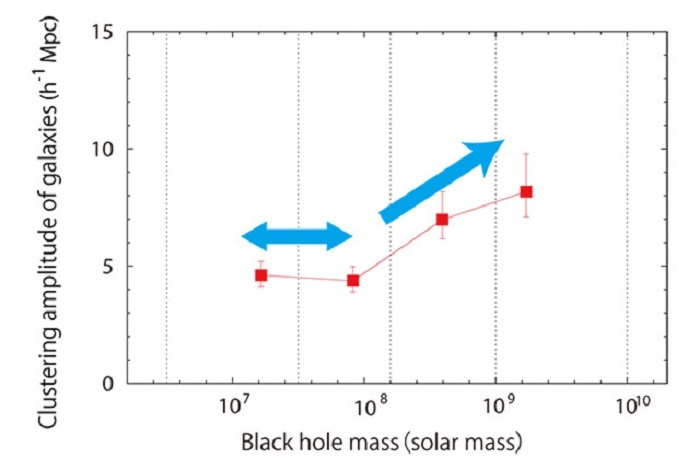 The difference of galactic density according to black-hole mass (the vertical axis shows the size of regions with enhanced galactic density: the bigger the size, the higher the density). The heavier black holes are located in galaxies with higher density for black holes with mass larger than ~10^8 solar mass. While the less massive black holes show no correlation between the mass of black holes and the density of galaxies.